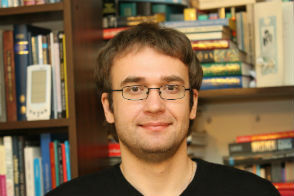 Péter Szegedi holds an MSc degree in physics at the Loránd Eötvös University of Science, Budapest and a Ph.D. in philosophy from the Hungarian Academy of Sciences with a thesis on deterministic interpretations of quantum mechanics. He is an associate professor of the Department of History and Philosophy of Science at Eötvös University. His main interests are interpretations of quantum theory and the determinism in physics. He has been carrying out and coordinating philosophy of science research projects in the department. Since 1975 he taught courses on history and philosophy of physics and on general philosophy of science at the Faculty of Sciences of the university. Andrew Schumann: Due to some names such as Imre Lakatos, the Hungarian tradition of philosophy of science became well known. Which contributions of Hungarian philosophers to this subject could you notify as the most important? Péter Szegedi: The first Hungarian who joined to philosophy of science was Béla Juhos (Vienna, 1901–Vienna, 1971), a Hungarian who lived mainly in Vienna. He was a truly logical empiricist member of the inner Vienna Circle all the time. He was interested in the epistemological (erkenntnislogische) foundations of sciences, especially physics. Juhos kept the torch of empiricism alive even after World War II, when – together with Viktor Kraft – he was the central figure of the so-called Third Vienna Circle. The discussions here exerted an influence on Paul K. Feyerabend and Wolfgang Stegmüller, as well. One of the main topics of the Third Circle was the problem of realism, which was later transferred to the English-speaking world and turned into a very important field of philosophy of science.